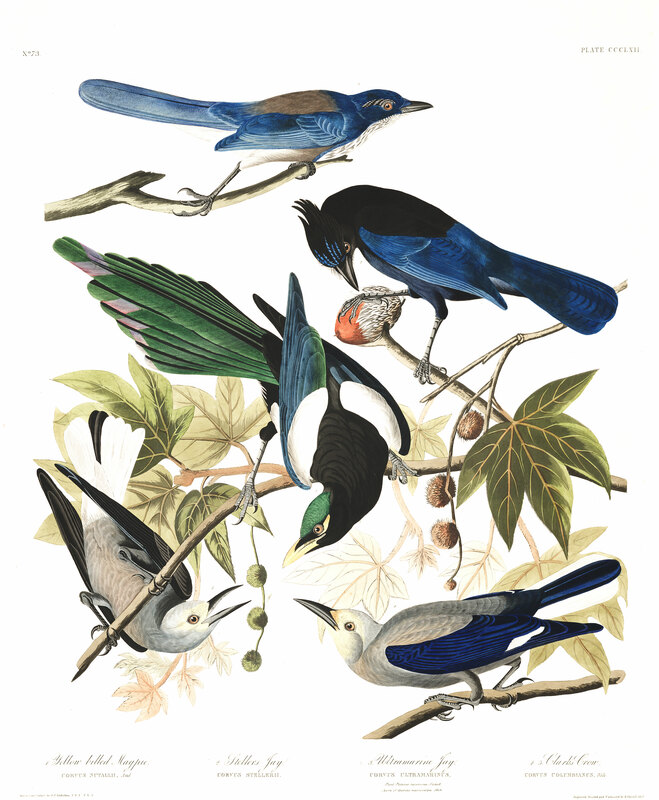 I have conferred on this beautiful bird the name of a most zealous, learned, and enterprising naturalist, my friend THOMAS NUTTALL, Esq., to whom the scientific world is deeply, indebted for the many additions to our zoological and botanical knowledge which have resulted from his labours. It is to him alone that we owe all that is known respecting the present species, which has not hitherto been portrayed. In a note inserted by him in my journal, he says: As we proceed to the south in Upper California, around the village of Sta. Barbara, we find the Common Magpie substituted by this remarkable species, which is much more shy and cautious, as well as more strictly insectivorous. It utters, however, nearly if not quite the same chatter. In the month of April they were everywhere mated, and had nearly completed their nests in the evergreen oaks of the vicinity (Quercus agrifolia). The only one I saw was situated on a rather high tree, towards the summit, and much concealed among the thick and dark branches, Their call was pait, pait; and on approaching each other, a low congratulatory chatter was heard. After being fired at once, it seemed nearly impossible again to approach them within gun-shot. When alighted in the thick oaks, they remained for a considerable time silent, and occasionally even wholly hid themselves; but after awhile the call of recognition was again renewed, and if the pair then met, they would often fly off a mile or more, without stopping, in quest of insects. We often saw them on the ground, but never near the offal of the oxen, so attractive to the Crows and Ravens around. CORVUS NUTTALL, Yellow-billed Magpie, Aud. Orn. Biog., vol. iv. p. 450. Bill and bare space beneath the eyes yellow; in form, proportion, and size, similar to the Common Magpie; the feathers of the tail narrower; the colours similar, but the top of the head glossed with green, and the black of the back and fore neck tinged with brown. Male, 18; wing, 7 3/4.